After a three-month postponement, BASS was finally able to hold the Sabine River event at Orange, Texas. The river was now back within its banks and conditions were stable after weeks of flooding. Flowing from Toledo Bend Reservoir, the lower Sabine divides Texas from Louisiana — ultimately forming an expansive brackish estuary at the Gulf of Mexico. 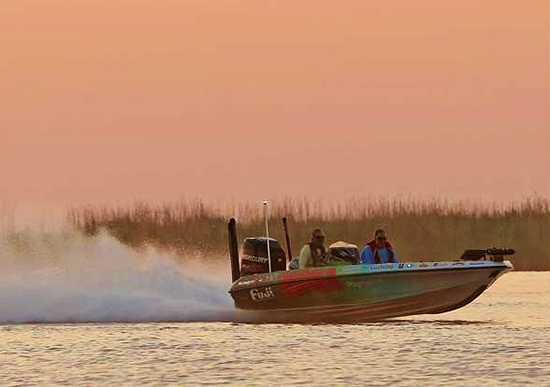 It supports a healthy population of largemouth bass, but catching keepers can be a challenge. To make it even tougher, we were restricted to the Texas side of the river. To enter Louisiana waters meant immediate disqualification. Aerial view of take-off at Sabine River Park with the Intracoastal Waterway is in the distance. Without the many canals and bayous the Cajun delta offers, the better part of the fishery was taken away. Worse, it concentrated the competitors into a much smaller area. To get around Texas’ 14-inch minimum size limit, BASS further restricted the boundaries to five Texas counties that maintain a 12-inch exemption. The size reduction was helpful, but it meant even less fishable water. To complicate things further, water temps were approaching 90 degrees and the air was even warmer. We knew it would be a test of endurance. Having scouted the area prior to cutoff, I wanted to revisit some of the more promising areas. They included Taylor and Hildebrandt Bayous and parts of the Sabine. I also wanted to explore the upper reaches of the Neches River. Having not seen it in years, I elected to start there first. I drove to a ramp located just above the saltwater barrier and almost immediately found bass. Most of the bites came on smaller Hildebrandt buzzbaits and spinnerbaits, casting them around cypress trees. I tried a popper, prop bait, hollow-body frog, square-bill crankbait and a variety of soft plastics, but the fish seemed to prefer skirted, moving baits. Entering a small feeder creek, I caught a quick 4-pounder and 2½-pounder. I left immediately, hoping to save more of the same for tournament day. From there, I concentrated on the main bayou — catching fish from numerous banks on both the incoming and outgoing tide. None were big, but the bites were plentiful. Later, I headed downstream past the city of Beaumont to check two oxbows. In one, I found an abundance of baitfish relating to submerged cabbage. Feeding on them were small, keeper-size bass and slot-legal redfish. I recorded the numbers on my Raymarine GPS then headed to the ramp. The Sabine River forms the border between Texas and Louisiana at the Gulf Coast. On day 2, I drove to Taylor and Hildebrandt Bayous hoping for some bigger bites. But after searching in a few key areas, all I caught were small bass. I still needed something better. On day 3, I put in at the official boat ramp at Sabine River Park. The lot was full, which meant most of the field had the same plan. Trolling north, I fished some vegetation along the main riverbank, then some old dock pilings. I caught fish off both types of cover but, in the back of my mind, I knew others would find the same fish and that it would take some serious luck to do well in a crowd. And the way my year was going, I wasn’t feeling lucky. I finished the day probing some ditches with no good results. It was time to prep my boat and tackle, then head for registration. Having drawn out in the second flight, I considered my chances of securing anything close and decided to make the long run to the upper Neches. Coming off pad nearly an hour later, I found Greg Vinson about to enter the small feeder creek where I caught the 4-pounder in practice. Fortunately, he was on the side opposite of where I caught the fish, so I eased in to work the right-hand bank. Instantly, I noticed things looked different. The water had more stain and there was no movement … not even a baitfish flicking the surface. Seeing that, I slowed my approach, picking apart every piece of cover in front of me. Fifty yards later, I heard Greg battling a fish behind me. It was big, too. Seconds later, he lifted a 4½-pounder into his boat … the very same fish I believe I caught in practice. (Four-pounders are rare on the Sabine, especially in such a confined places. So it had to be the same fish.) Minutes later, he boated a 2½-pounder. To my astonishment, the only fish willing to bite were now on his side of the creek … not mine. More than an hour passed and neither of us saw any further action. Dejected, I left to try my backup areas. The minutes turned to hours as I slowly caught fish after fish. Unfortunately, most were short of 12 inches. My lure selection included a 1/4-ounce Hildebrandt Tin Roller spinnerbait with tandem silver blades and a green-pumpkin Yamamoto Craw rigged Texas-style with a 3/8-ounce VMC tungsten weight and Ike-Approved 2/0 Flipping Hook . By afternoon, the tide was beginning to rise, bringing some much-needed current with it. On one large grouping of cypress trees, I finished my limit then it was time to leave. Relieved to have five keepers in the boat, I added some ice to the livewell, then turned the valve to the “recirculate” position. I didn’t want to lose any fish during the long run back. When I reached the Sabine, I had a few minutes to spare, so I tucked into a nearby creek and started probing a submerged grassbed. Immediately, I boated a small keeper. When I went to cull, I discovered the livewell was empty and all of my fish were on their sides. In a panic, I cranked the big engine and threw it in reverse … forcing water back through overflow tubes. Two minutes later, I counted three live fish. My two biggest were dead. I was beside myself. How could a valve fail like that? In 30-plus years of tournament fishing, I’ve never had a problem losing water through a closed livewell valve. Disgusted, I went to the scales knowing I would be assessed an 8-ounce penalty. And in an event where every ounce is crucial, I managed to dig myself a deep hole. When the dead fish penalty was deducted, I ended up with 6 pounds, 5 ounces — 1½-pounds off the pace. Although aggravated, I knew I still had a chance. Cypress trees are magnets for tidal-water bass. On day 2, I opted to return to the Neches and pick up where I left off. This time I was first to the little creek where Greg had caught the 4-pounder. I fished slowly and methodically, hoping to score just one or two good bites. They never came. From there, I ventured into the main bayou to dissect some isolated cypress trees, and that’s where I caught my first two keepers. Again, the hours quickly passed, and though I boated another 20-plus fish, only one made the 12-inch minimum length. With three keepers, my day was done and it was time to face the music. In the end, Greg Hackney won the tournament by a landslide. Watching the coverage on BASS Live, I learned how I had missed the better bite. Tidal waters are all about timing and lure selection, and I was off on both throughout the week. Hopefully things will change soon, as this season is beginning to take a major toll.